Harold Frank “Jerry” Walter was born on November 25, 1915, in Mount Pleasant, Iowa, according to his Social Security application which was transcribed at Ancestry.com. The same birth information was reported in the Post-Star, November 9, 2007. However, the Social Security Death Index has Walter’s birth month as October which may have been a clerical or typographical error. Walter has not been found in the 1920 U.S. Federal Census. A search at Ancestry.com has links to travel records in Brazil for Walter and his parents who may have been out of the country during the census enumeration. The 1930 census recorded Walter and his parents, Pliney and Clara, in Westfield, New Jersey at 307 Hazel Avenue. His father was a planning engineer of telephone equipment. The New York, New York, Marriage License Indexes, at Ancestry.com, includes a “Harold F. Walter” who married “Ethelynde Stimpson” on October 2, 1940 in New York City. 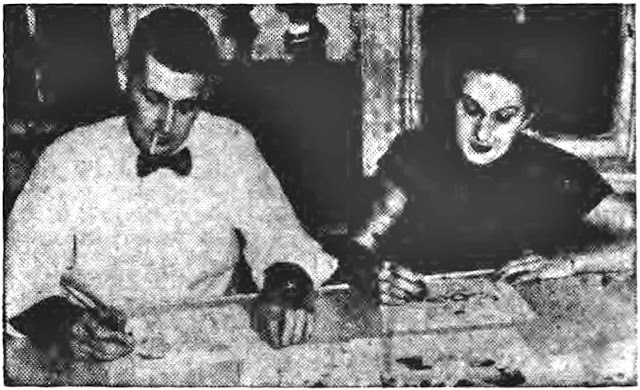 American Newspaper Comics (2012) said Walter and his wife produced Susie Q. Smith, which started as a panel in 1945 with the King Features Syndicate. The McNaught Syndicate continued the series as a strip on February 9, 1953. It ended November 28, 1959. The series was bylined “Jerry and Linda Walter”. The couple created Jellybean Jones for King Features which syndicated it from March 4, 1946 to 1949. The panel was credited to “Frank Walter”. For Newsday Specials, the Walters did The Lively Ones which debuted May 17, 1965 and ran into 1966. In 1950 Walter illustrated an educational workbook. At some point Walter and Linda divorced. Walter remarried to Clarice O’Hara. Walter passed away November 7, 2007, in Glens Falls, New York. Walter was laid to rest at Pine View Cemetery.